Bright and early Sunday morning the Cruisers descended upon our cul-de-sac so we could carpool together to the 2015 George Washington Parkway Classic Ten Mile Run. 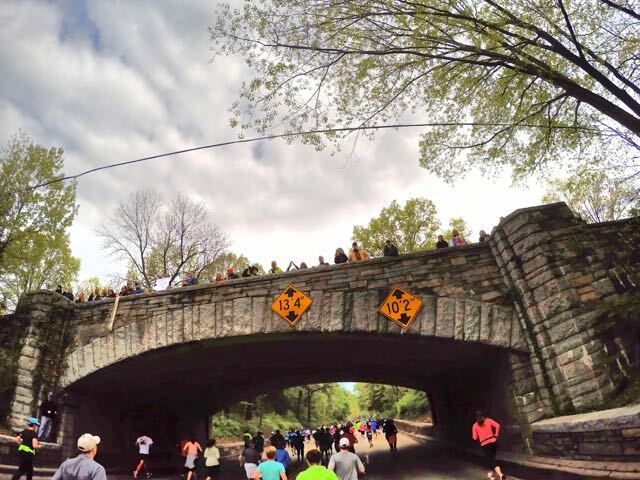 It was the 31st running of this very well organized race that’s run on one of the most beautiful race courses in the DC area. 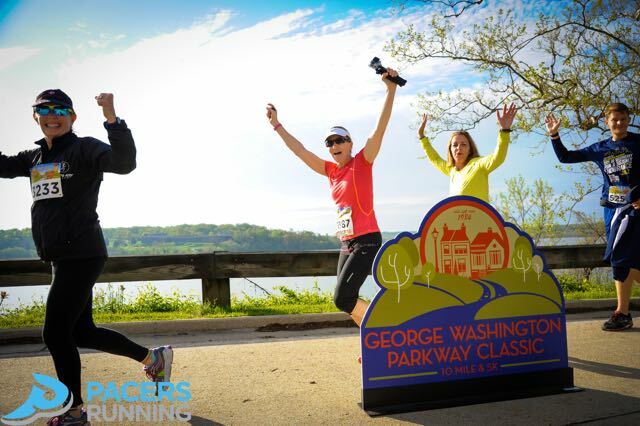 This iconic race on the GW Parkway runs from Mount Vernon to Old Town Alexandria along the beautiful Potomac River. 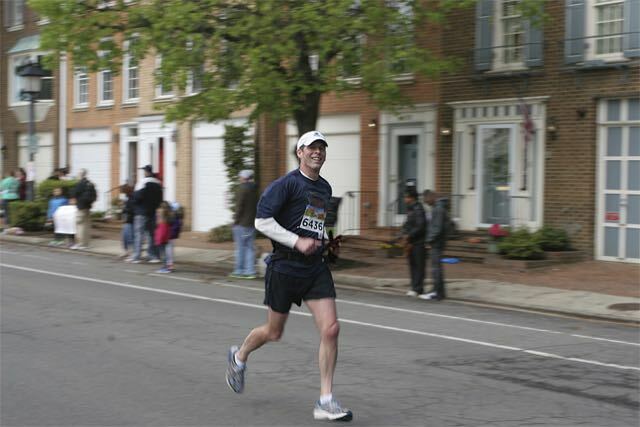 Bill and I have been running this race for years, and if you’re interested in catching up on my recaps from 2013 or 1999-2012, click on the blue links. We were lucky enough that our Cruiser friend Vamshi offered to pick up our race packets earlier in the week, so we didn’t have the make the trip to Alexandria twice. 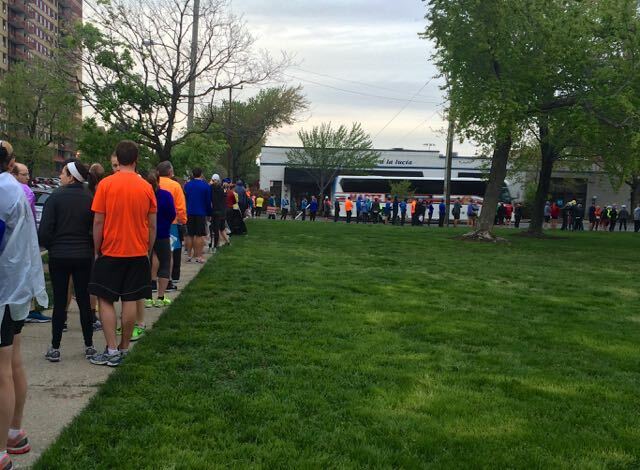 I do this every year – I forget that they start packet pick-up a full weekend before the race, and don’t take advantage of the less crowded early pick-up locations. Unfortunately, early Sunday morning I got a text from Vamshi saying that he wouldn’t be able to run in the race and we really missed him. 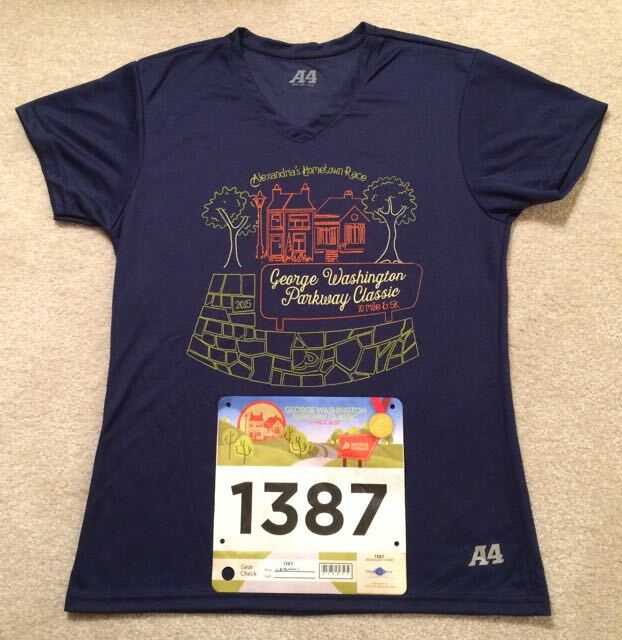 This year’s shirt has a cute design of Old Town Alexandria, and fits me well. I’m not crazy about the navy, but that’s just me. I have a feeling most people really like it. We left the Crown Plaza and headed to get in line for the buses to arrive to take us to Mount Vernon. I love point-to-point races, but getting runners to the start adds to the timing and logistics of race morning planning. We arrived when the line stretched the length of the block and rounded the corner for the length of that street. By the time the buses started arriving back from Mount Vernon, the line had almost encircled the entire block. 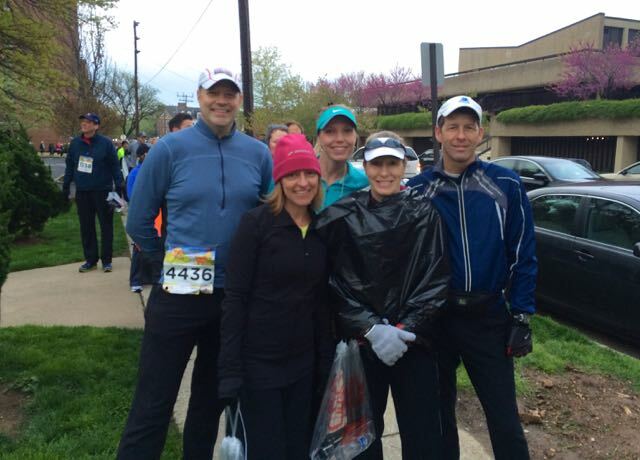 We found our place and asked the runners in front of us to snap this picture. I won’t point fingers, but the two in the front look homeless. I may not have looked fashionable in my throw-away clothes and garbage bag, but I was warm. I had been stalking the weather all week and much to my surprise, late Saturday afternoon the rain was taken out of Sunday’s forecast and the temperature was expected to be around 50° at race time. The sky gradually cleared as we stood in line, and by the time we got to Mount Vernon, the sun had broken through the clouds. Over Easter weekend, Bill hurt his knee helping our son move some furniture. Unfortunately, he was not able to run in his favorite race. Being such a nice guy and avid photographer, he still wanted to come with us to shoot pictures of us finishing. 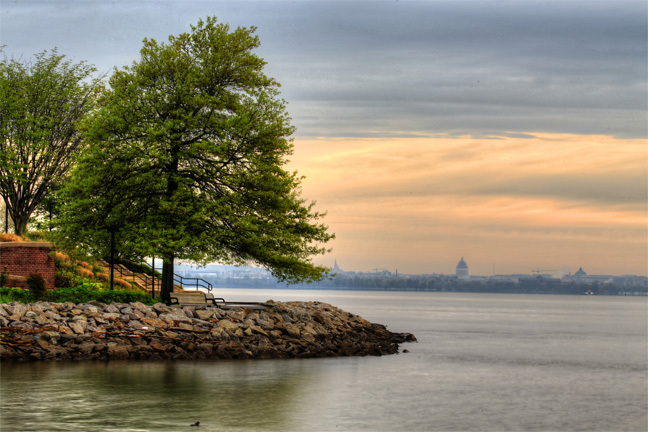 Once we headed to the buses, Bill walked along the waterfront in Old Town, and shot pictures of the sunrise. Even though the lines were long, we didn’t have to wait very long for our bus. 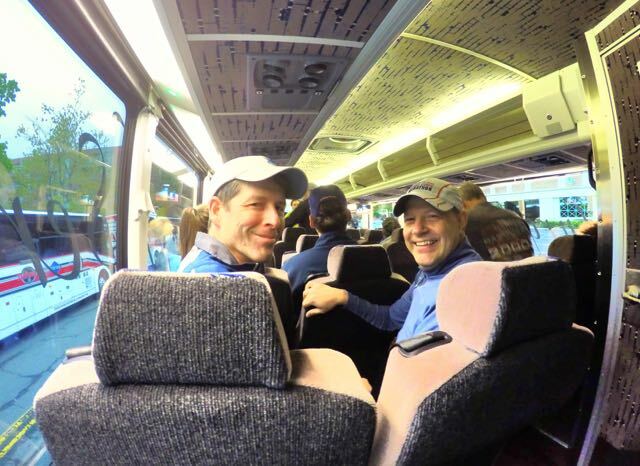 We were lucky enough to be among the first to get on our particular bus, and were able to snag seats in the back next to….. Wait for it….. Wait for it….. The restroom! 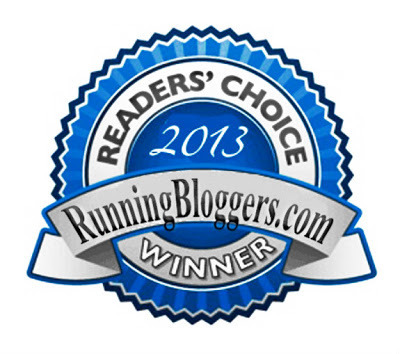 Yes, this well-hydrated runner needed to go again! Alan and Joe put up with our shenanigans, and probably rolled their eyes when they turned back around! 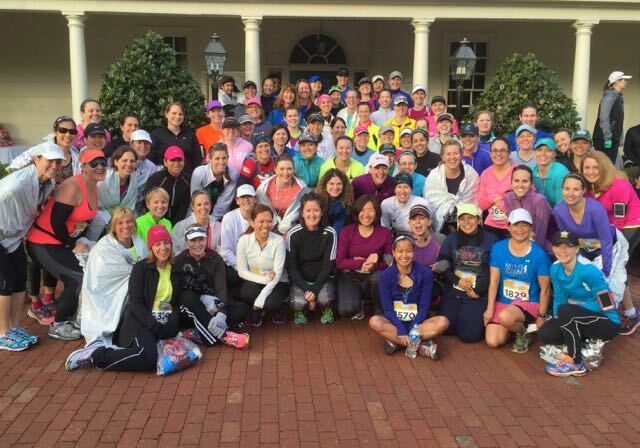 We arrived at Mount Vernon with just a few minutes to spare before Kim, Beth, and I headed to our meet-up place for our multi-chapter MRTT group photo. Just as I hopped up after the photo, someone called out my name. It was Sue from This Mama Runs For Cupcakes, and I hadn’t even noticed her sitting directly behind me when I sat down for the picture! As soon as we took our group picture, Beth and I took off to bag check. 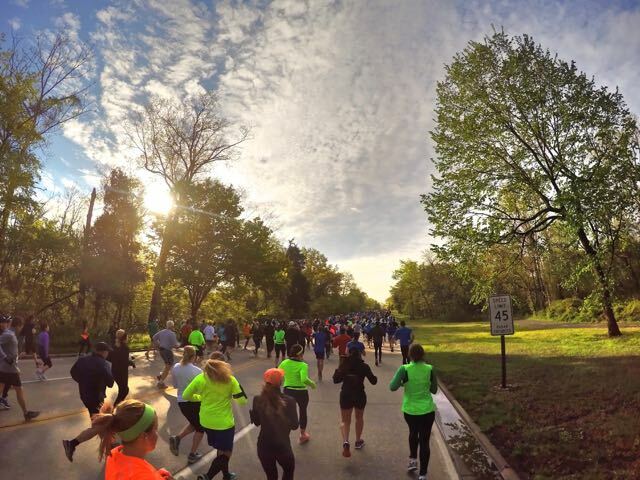 I had planned to keep on one of my sweatshirts and drop it along the course when I warmed up, but I made a last minute decision to check all of my warm clothes and run in my short sleeved shirt and capris. It was the best decision of the day for me. I left on my plastic bag until moments before the starting gun and then ripped it off and shoved it safely out of the way of the runners. 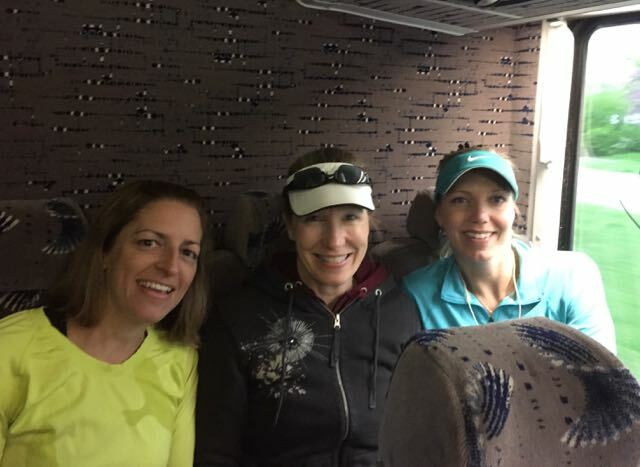 Right after the singing of the National Anthem, our MRTT friend Kathy found us amongst the thousands of runners. She had missed the group picture, so we hadn’t had a chance to see her yet. 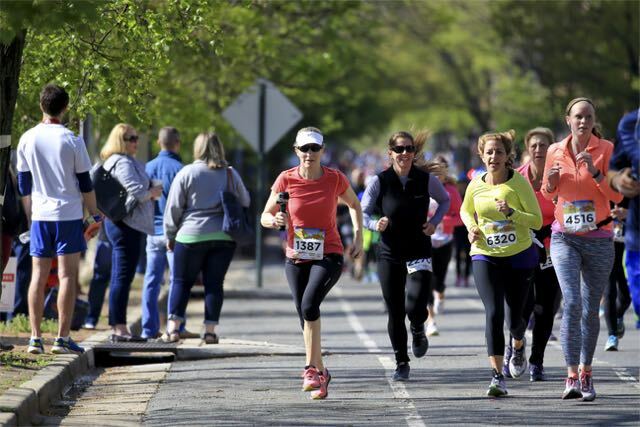 As soon as we sent her closer to the front of the pack (she’s super speedy), Beth and I seeded ourselves with the other nine minute/milers, and just like that the starting gun fired. 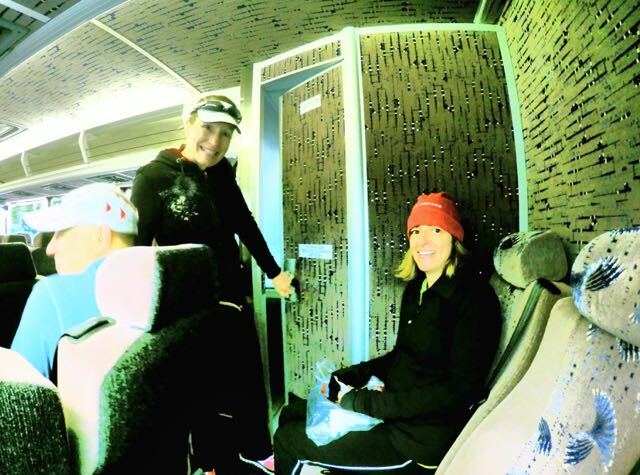 And simultaneously to the starting gun, there may have been an f-bomb or two thrown when I realized that I hadn’t started my Garmin in time to find a signal, and during those moments I learned a lot about myself….. I love my little gadgety things that make running so much easier and more enjoyable – when they work, or when used properly. Enter – my Garmin. Once again I forgot to start my GPS until right as the starting gun went off, and if you’ve run with a Garmin, you probably know that it’s a lot harder to find a satellite signal when moving. After running 2.39 miles while searching for that elusive satellite, I hit the jackpot! That was after almost 25 minutes of whining and complaining. Poor Beth! The Cruisers have a very strict rule that you’re not allowed to curse until mile seventeen, and I didn’t adhere to it at all. 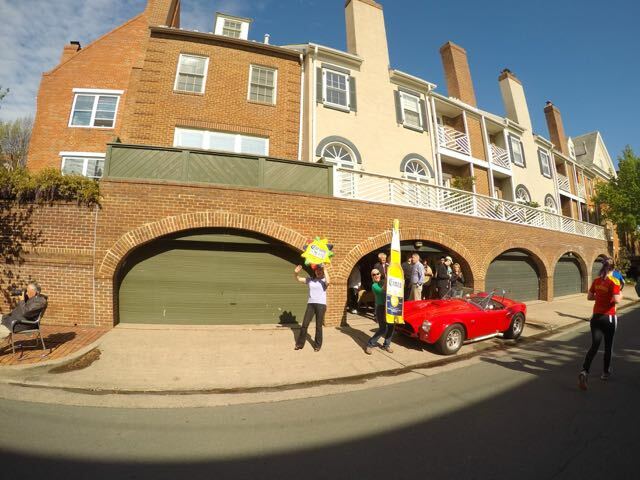 Now that the satellite and I were besties again, I relaxed and started playing with my GoPro. Bill gave it to me for my birthday in mid-November and I had yet to use it on my own. Bill gave Beth and me a quick tutorial on how to use it and the remote control just before we left the hotel, so I had her as my backup for technical support. Beth and I started taking turns carrying the GoPro and remote control, and got quite carried away taking pictures. We took 1,984 pictures to be exact. Each time we pressed the remote control, it took a burst of 30 pictures! 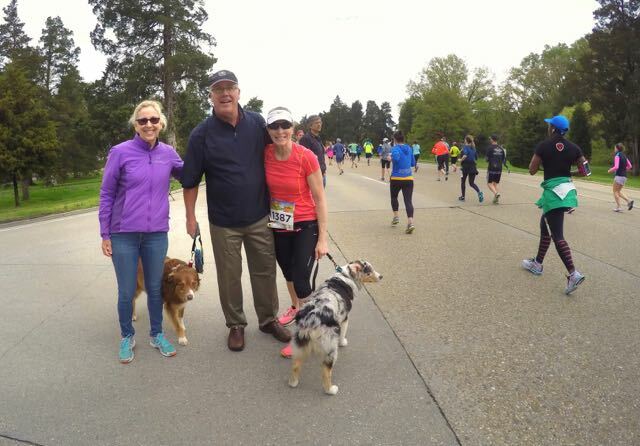 Around the 4.5-mile mark we started looking for my friends Barb and Lou, and their dogs Obbie and Takoda, both Australian Shepherds. Every year Barb is out cheering us on, and often it’s the only time I see her all year. Thank goodness for Facebook to stay in touch! 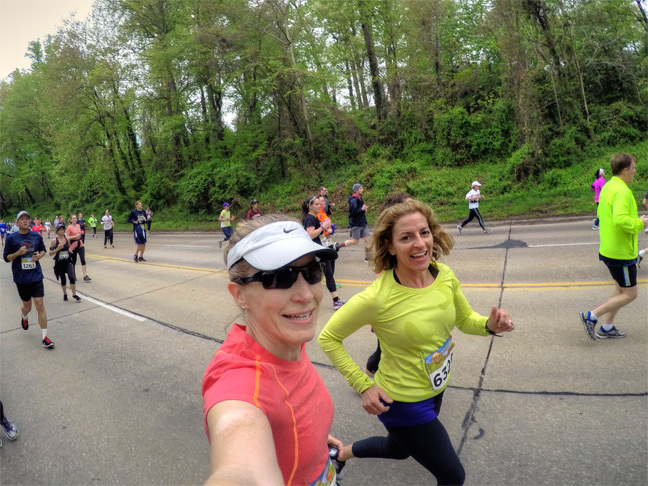 After leaving our friends, we continued on for the second half of our race, holding the GoPro up in the air and snapping away while we ran. Just for the heck of it, I turned the GoPro around for a selfie. 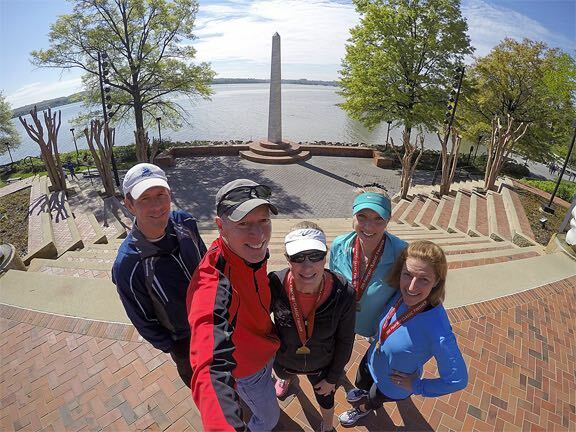 And then we goofed-off as we ran past scenic overlook photo booth! 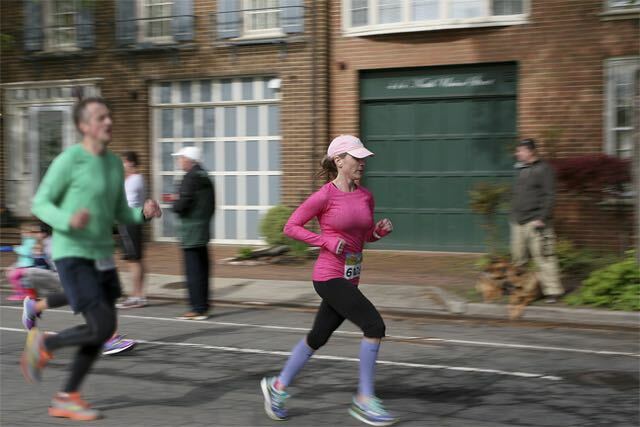 While Beth and I were still way back on the course, the lead runner came in so quickly that he took Bill by surprise. Bill caught him (in the blue) just as he crossed the finish line with the second place runner close behind. This lady and young girl were finishing the 5K at about the same time. Bill was shooting with two cameras. He had his long lens for catching us as we ran toward him, and he had another camera with a shorter lens for snapping pics as we got up closer. This was his view as he looked down the street searching for us in the sea of runners. Speedy Alan came in first with a time of 1:15:21 (7:33 pace). It should be noted that Alan’s longest training run this training cycle was a six miler. He’s a very strong runner, and ran Boston with the Cruisers in 2010. 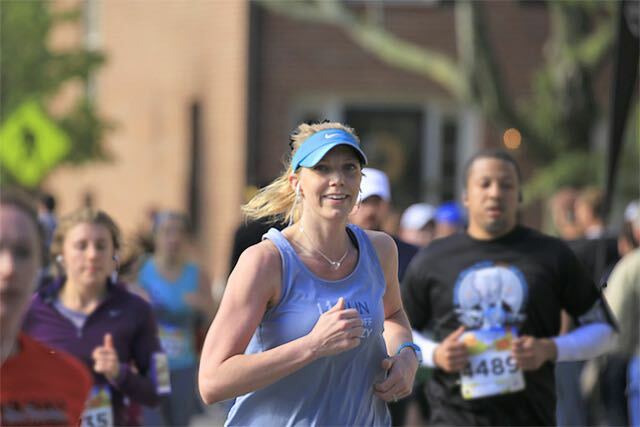 Next was Kathy with a time of 1:18:04 (7:49 pace). 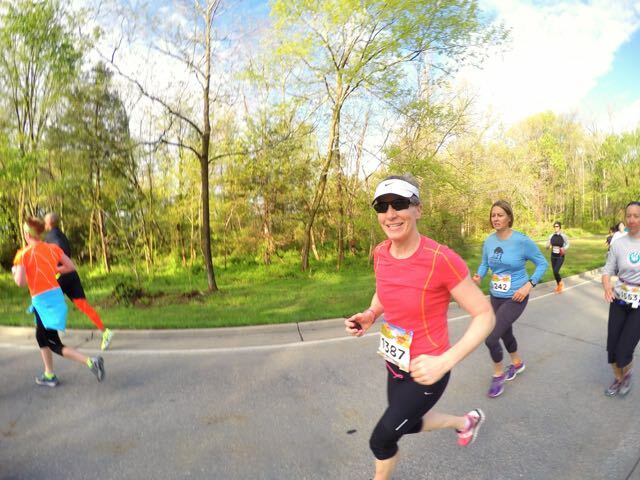 Kathy finished third in her age group, and in such a huge race that draws thousands of runners and many elites, that’s extremely impressive! Next came Kim with a time of 1:25:14 (8:32 pace). Kim has gotten so fast this racing season, and it has been so fun watching her do so well. She’s been setting one PR after another, and so far in 2015 she’s set PR’s in the half, 10-mile, and 10K distances. I spotted Bill when he was just a little speck in the distance, and immediately started barking orders to Beth. 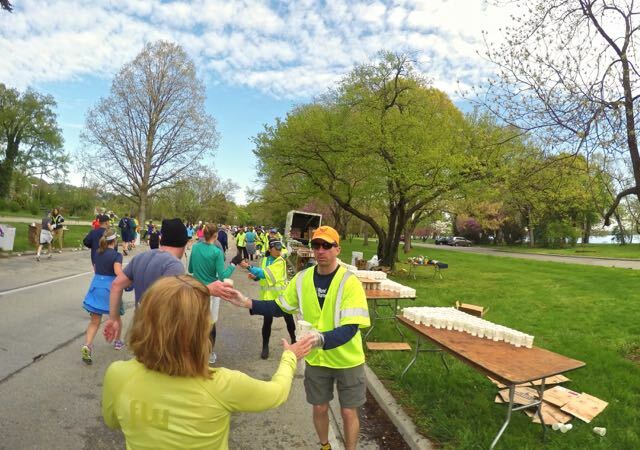 Our first order of business was to move over to the right side of the course, and try to stay clear of the other runners. 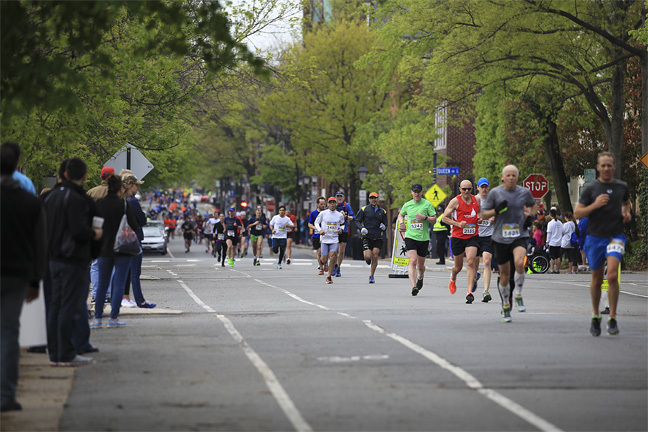 We picked up our pace, put a smile on our faces, and hoped for a race photo that didn’t make us look like we were walking. I think Bill did a great job! Beth and I finished together with a time of 1:38:48 (9:53 pace), adding one more to the many races we’ve finished together. 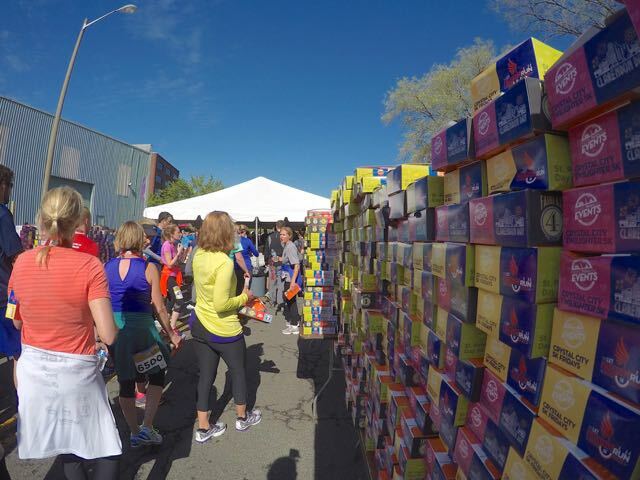 We collected our finisher’s medal, boxed post-race snacks, and made our way out of the finisher’s area to find Bill and the rest of the Cruisers. 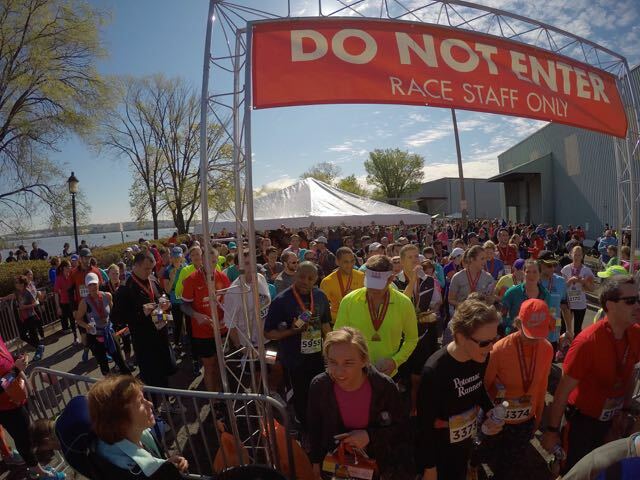 Immediately after stepping out of the finisher’s area we heard Bill call our names. Reunited, we stopped for a picture on our way to pick up our bags that we had checked earlier. 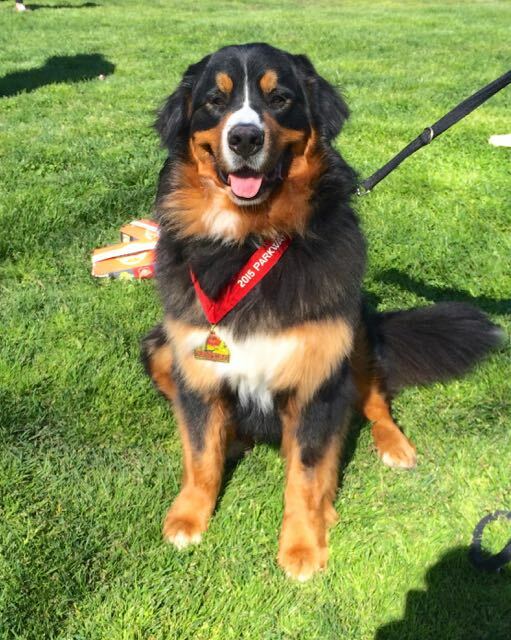 I saw Murphy modeling his finisher’s medal, so I stopped to say hello and ask for a picture. His humans said that he had run the race with them (I’m assuming the 5K, but don’t know for sure). Joe’s wife met him after the race, so he didn’t ride home with us, and missed the last couple of pictures. We also missed seeing at least one other Cruiser, Ravi, when we chose not to go into the post-race beer garden. 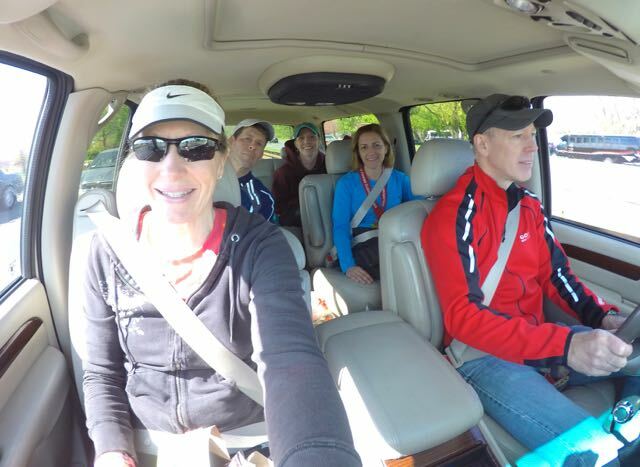 And because Cruiser-mobile selfies are always fun….. In one of the pictures, Bill blinked, so his eyes are closed. It’s hilarious because the rest of us are smiling for the camera, and the driver has his eyes closed! Overall it was a fabulous day, and Bill and I commented several times later about how much fun we had. We always have fun at races, especially when we get to hang out with our Cruiser friends. I’m sure Bill would have had a lot more fun if he could have run, but at least he was able to do something else that he loves to do, taking beautiful pictures! 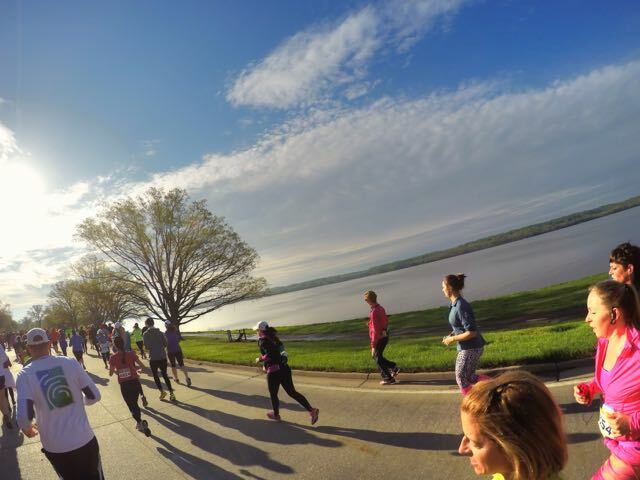 Where is the most beautiful place you’ve run or vacationed? ~ It would have to be Maui for me, but I don’t have any pictures of us running. What color running capris or shorts should I wear with my race shirt? If you have a dog, has he/she ever run a race with you? Great pictures! I’ve never thought of borrowing my husband’s GoPro for a race. He’s got it all set up for his bike… This was my 8th year running this race and I’ve almost got my pacing right! Thanks! 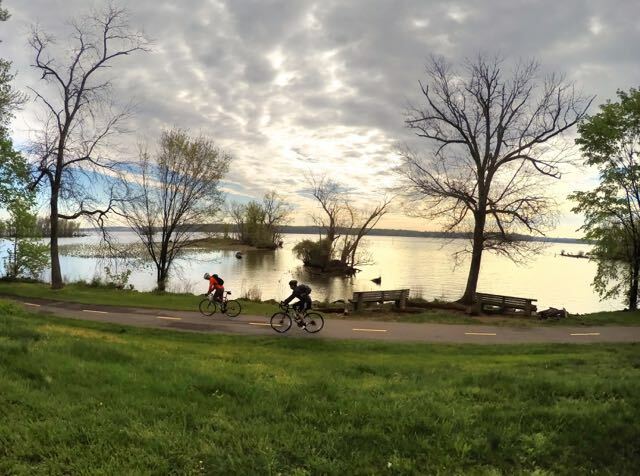 You should definitely abscond with your husband’s GoPro. I love just taking pictures on the run and not having to worry about stopping to hold the camera steady. I didn’t even think about asking to see if you’d be at the race. Another time for sure! So much going on in this post! Congrats on a great race! Sorry to hear your hubby couldn’t run, it’s really nice he came and took pictures. That’s a huge group! I like all the go pro pics- very cool to have that may pictures to sift through. Did it bother you carrying it? 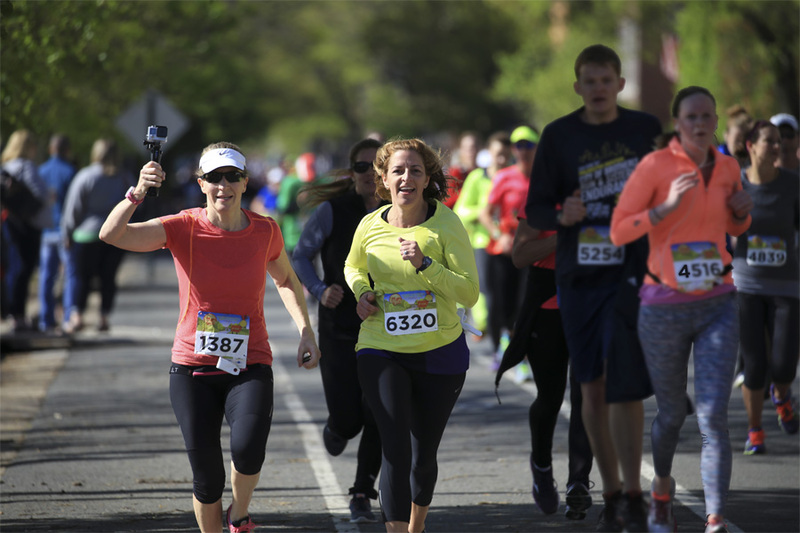 I didn’t mind carrying my GoPro for the ten-miler, but I wouldn’t want to carry it for a marathon, or a race that I was actually racing. I do have three very nerdy body straps for carrying it – one goes on my head! HaHaHa!!! 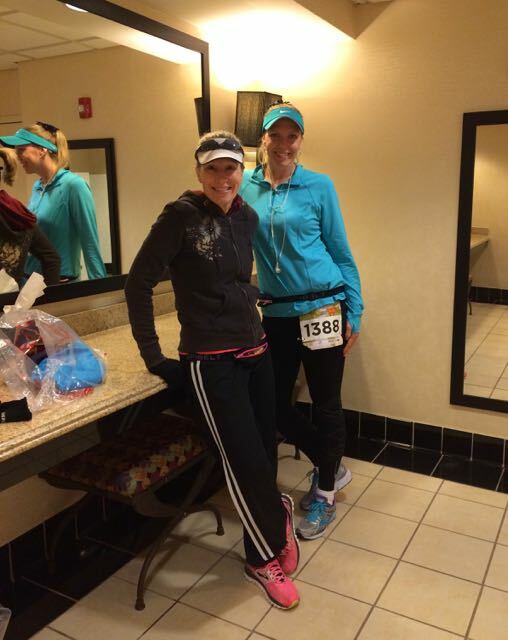 Jennifer recently posted…2015 Chicago Marathon – Am I IN or OUT? I tried to get a picture of Bill, but I took it too early. 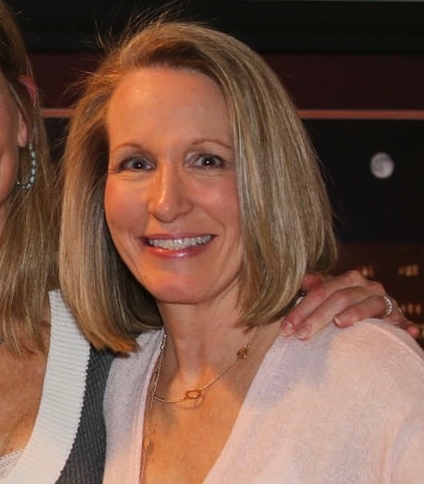 I guess I was too busy smiling for the camera to hit my remote control again! I’ve seen a lot of dogs over the years at various races. I’m always amazed when they do a whole race. One of my friends has a dog that runs five miles with us almost every Thursday morning. He’s so good and stays right at our pace. She says he goes home and immediately crashes, but she has to shower and go to work! HaHa! Gosh, it looks like you had so much fun! 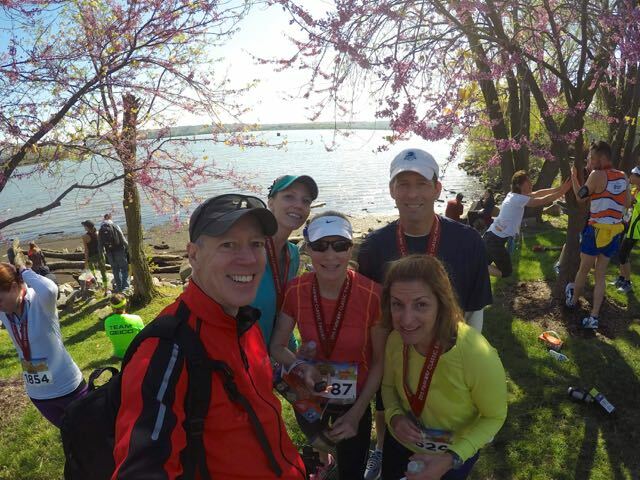 Running with friends makes it extra special. Every time I read your posts, I remember I have a GoPro that I need to use. I do not have a remote control. The remote control makes the GoPro so much easier to use. Mine was a gift, but I think it cost about $75. Cool! Wish we’d realized it, so we could have met. Beth, Kim, and I got there with only seconds to spare and jumped right in! That’s neat that the Go Pro takes a burst of 30 pictures. It’s a lot to sort through, but you can definitely find the perfect action shot amongst the group! Is that the norm for the Go Pro, or is it a setting that Bill had it on? Either way, you got some awesome pictures. Bill did, too, as always! I think Alan and Barry would make good running partners! They both have similar training 😉 but still run strong on race day. 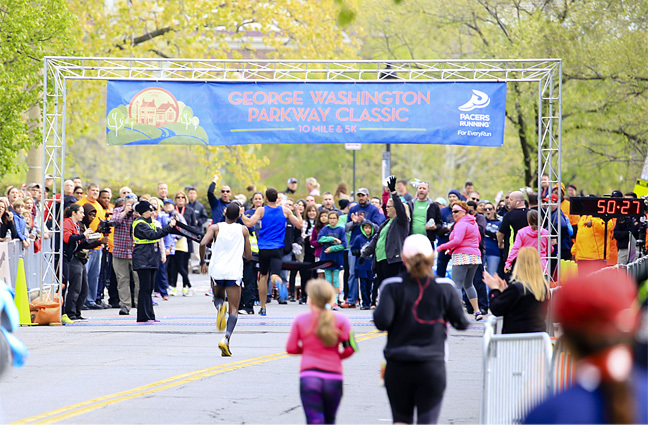 I’ve been interested in running the GW Parkway 10 Miler ever since reading about it on your blog and on Logan’s. The only thing that holds me back is all that concrete. I think it would tear my shins apart! 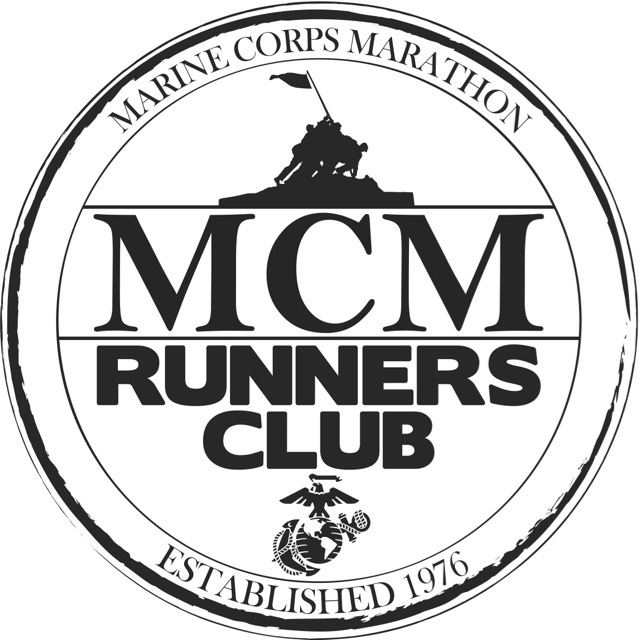 If you ever decide to come up and run it, let me know so I can sign up, too (although we usually do). We could just take it easy, not worry about time, and hopefully not tear our legs up as badly. Plus you’d get to meet Obbie and Takoda, AND Roger could bike along the path beside us!